*update* Damn, I got there too late to get a cub-cake, which is basically good news because Xanadu sold 300 cupcakes for BC/EFA. I did catch a glimpse of the very dapper Cubby and I saw Kerry outside the theatre. I also got a fabulous Cubby pin and his business card for future reference. Come and buy a cupcake for charity from Cubby Bernstein and friends. 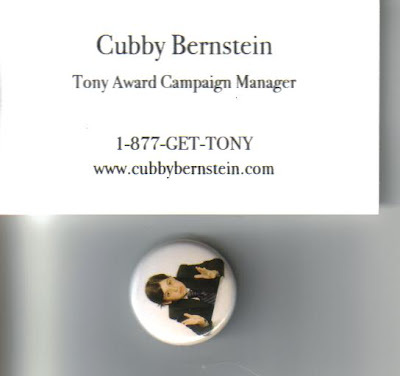 With award season in full swing, famed and notoriously private Tony Campaign Manager Cubby Bernstein will make a rare public appearance to deliver a much anticipated speech outside the Helen Hayes Theatre, 240 West 44th Street on Wednesday, May 28th and it is not to be missed! Cubby along with the cast of XANADU will be on site to sell cub-cakes to the public, as he instructed Julie White to do before her Tony Award win last year. The producers of XANADU, Robert Ahrens, Brian Swibel, Tara Smith, Cari Smulyan, Dale Smith and Dan Vickery have chosen that all proceeds will go directly to Broadway Cares/Equity Fights AIDS. As many people know, Cubby Bernstein is a legend in Tony campaign strategy and chooses one show a season to put his stamp on. This year, after a great deal of thought, Cubby has chosen XANADU as the show to guide through award time. Come celebrate the first year of Broadway's surprise musical hit, XANADU with 2008 Tony nominations for Best Book, Best Actress, Best Choreography and the coveted Best Musical Award. It has already received the 2008 Outer Critics Circle Award for Best Musical and the 2008 Drama Desk Award for Best Book. For information on XANADU, go to www.xanaduonbroadway.com. And don't forget to check out www.cubbybernstein.com as well.